Overwatch League's opening weekend showed how boring the "3-3" meta has become. The second season of Overwatch League started last Thursday. Viewership was decent, there wasn't an empty seat in the house, and Blizzard once again attracted the attention of huge sponsors in State Farm and Coca-Cola. The OWL product seems to be in a healthy state in all areas except one—the game itself. Dominated by what has become known as the GOATS meta, Overwatch's best players demonstrated exactly why the game has become a chore to both play and watch. Named after the Overwatch Contenders team that made this strategy popular, GOATS originally referred specifically to the character lineup of Reinhardt, Zarya, D.Va, Brigitte, Lúcio, and Moira, which takes advantage of the tanks' massive health pools and the supports' AoE healing. The term has since expanded to refer to basically any lineup using three tanks and three supports. Slight variations exist depending on the map or situation, but the general idea revolves around buffing and regenerating high HP tanks to get the job done. Between GOATS' crowd control potential and annoying shields, there's not much this composition can't accomplish at any level of play. And it's incredibly boring. Even with Winston, GOATS relies on deathball-style play to be effective. Positioning is still important, but winning Rein mind games or getting a single kill with a D.Va bomb is often more significant. To make matters worse, deviating from GOATS against a team that's using it can often lose the match. Whenever an OWL team went for a GOATS counter, both Twitch chat and the Blizzard Arena erupted in catharsis. Sombra appears to be the anchor to a successful GOATS counter-comp, though teams such as the Houston Outlaws and New York Excelsior also utilized Pharah's mobility to give their opponents fits. With Sombra, though, a well-timed hack or EMP can make the opposition's HP and shields count for absolutely nothing. In the textbook play above, Dante "Danteh" Cruz has EMP charged and ready to go. As the entirety of the Boston Uprising moves in to engage, he and Austin "Muma" Wilmot team up for an EMP-Earthshatter combo that effectively ends the round as the Outlaws need to advance the payload just a few more yards. In pro play, the most effective composition will almost always be played by every single team on every map. Their job is to win games, so they're usually tied to the meta. Things can be a little more relaxed on the competitive ladder, but as is usually the case, casual play tends to mimic pro play. And though there are counters, GOATS is almost always the right choice today. And a boring one. This was certainly the case during OWL's opening weekend. Most matchups consisted of GOATS vs GOATS, or if a team tried a different composition, they soon switched to a three-tank three-support lineup of their own. Viewers made their frustration known, too. A highly upvoted post on r/Overwatch simply said "OWL in a nutshell." The post is a video of the Hangzhou Spark beginning a match with a four-DPS lineup, then quickly running back to spawn and switching to GOATS. 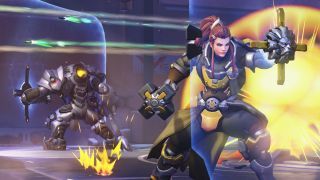 Blizzard has taken aim at the tank meta already, with the latest patch reducing the effectiveness of armor (thus nerfing tanks across the board), while previous patches had already taken aim at Brigitte's effectiveness. But clearly those actions haven't been enough. One solution to this staleness that the community has been rather loud about is the implementation of hero bans—something Rainbow Six Siege added last year. Some, such as Outlaws' GM Matt Rodriguez, have suggested that just one ban per team per map would rejuvenate the Overwatch experience. Imagine a world where Brigitte rarely made an appearance in Overwatch League, and star DPS players actually got to play their beloved damage dealers for longer than one or two spawns. Forcing professional players to consider their options on a per-map basis could lead to a much more exciting viewing experience. Instead of being relegated to Brigitte duties, flexible OWL players such as the Valiant's Brady "Agilities" Girardi and the Mayhem's Kevin "TviQ" Lindstrӧm could go back to the heroes they built their careers on. Overwatch prides itself on its diversity of playstyles, so much that Blizzard naively assumed that players would take pride in mastering multiple heroes for different situations rather than maining one. If we're ever going to see Overwatch's full range in OWL and our own games, though, the dull meta has to be addressed—if not with hero bans, then some other way. Lots of people are still playing Overwatch and there's plenty of hype for OWL, but the GOATS meta is not the way to keep interest up, especially as new games such as Apex Legends compete for attention. Overwatch is aging, and it's due for a major change to liven things up. Blow up the meta, Blizzard. It's time.